Japan’s incursions into India at Imphal-Kohima, 1943 were repulsed by Slim’s army in the spring of 1944. The Burma campaign was the longest land campaign either the British or American armies waged during World War II. It is also the least remembered. 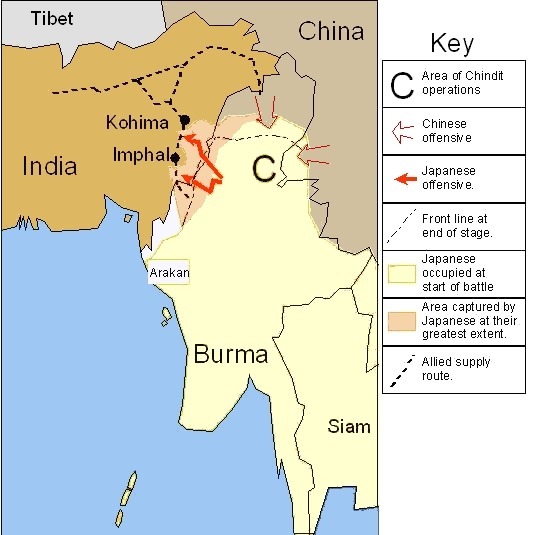 In 1942, the Japanese overran Burma quickly, pushing the defending forces, nearly all from the Indian Army, into rapid retreat. That army was but newly raised, incompletely equipped and trained, and without air support. Its 900-mile withdrawal, the longest in British military history, was conducted by a little known Indian Army major general named William Slim. After their retreat the shape of the Burma campaign would be determined by two factors. First, the Americans wanted a restored overland link to China to replace the lost “Burma Road.” In its absence came the American “Hump” airlift. But that was expensive and could deliver only relatively small quantities of supplies. 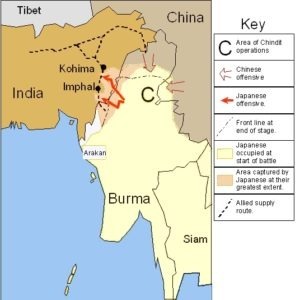 Second, the war in Burma could be won only by the Indian Army. Long the strategic reserve for the British Empire “east of Suez,” the Indian Army had had a disastrous opening to its war with Japan. Expanded much too rapidly, largely to meet imperial needs in the Middle East, it was badly mauled in Malaya and Burma. But in 1943 everything changed. Churchill reorganized the command structure for the war in Burma. All troops involved were grouped under a new command, the Fourteenth Army. 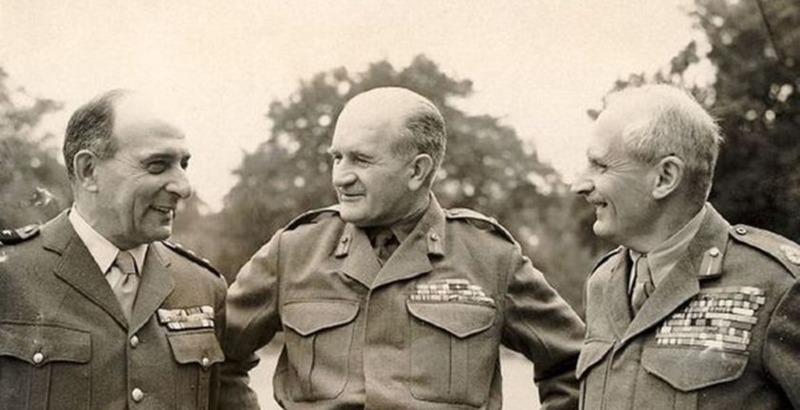 (A war correspondent soon christened it “the Forgotten Army.”) Slim, now a lieutenant general, assumed command. The Indian Army was reorganized and retrained. Slim had learned on the long retreat how to fight the Japanese; his ideas now infused his command. The Fourteenth Army met and defeated a Japanese offensive against India’s eastern frontier in a sprawling three-month battle in the spring of 1944. Known as “Imphal-Kohima,” it was the worst defeat the Imperial Japanese Army had ever suffered. It opened the door to the reconquest of Burma. The demands of the enormous war it was waging far exceeded Britain’s demographic resources. The Fourteenth Army is often described as British. In fact it was polyglot and multi-ethnic. Its backbone was the rebuilt Indian Army. Just three British infantry divisions fought in the East in World War II, and only one in the Fourteenth Army. The Indian Army reached 2.3 million strong by 1945—the largest voluntary enlisted army in history. It was the foundation of the imperial war effort from Burma to the Mediterranean, where it sent four divisions for the Italian campaign. As the war ground on, Britain faced a manpower crisis. The British personnel that were once part of Indian Army units began to disappear. By the time Slim’s Army completed its reconquest of Burma in 1945 it was only 13% ethnic British. Its UK component was outnumbered by three African divisions that were also part of Slim’s remarkable command. 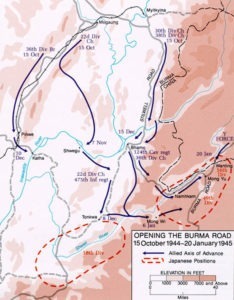 Opening the Burma Road, October 1944-January 1945. 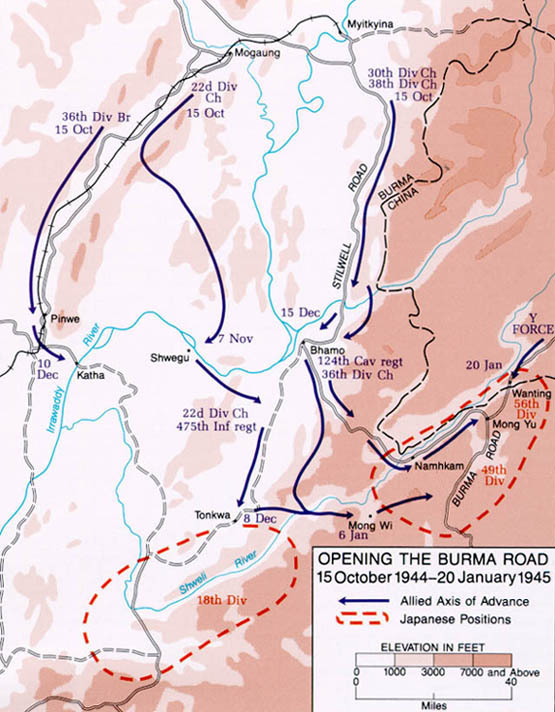 The campaign that carried Slim from the borders of Burma to Rangoon is considered by military historians the greatest feat of operational maneuver by a British general in the 20th century. Slim had said he wanted soldiers who could go anywhere and do anything. In the Fourteenth Army, that is what he had in 1944-45. As the British Raj in India reached its final days, Slim had two offers. Nehru wanted him to become the first commander-in-chief of independent India’s army,. Pakistan’s Jinnah offered him the governorship of East Pakistan (now Bangladesh). Seeing more politics than soldiering in both offers, Slim declined, and in April 1948 retired from the Indian Army. His retirement was not long-lived. Prime Minister Clement Attlee restored him to active service in the British Army and appointed him Chief of the Imperial General Staff. He was the only officer from the Indian Army ever to hold that post. He shaped Britain’s early Cold War army. Then came appointment to the still important ceremonial position of governor general of Australia. While there he wrote his classic memoir, Defeat Into Victory, still in print sixty-two years after its 1956 publication. Returning to Britain, he took up his final posting: Constable of Windsor Castle. 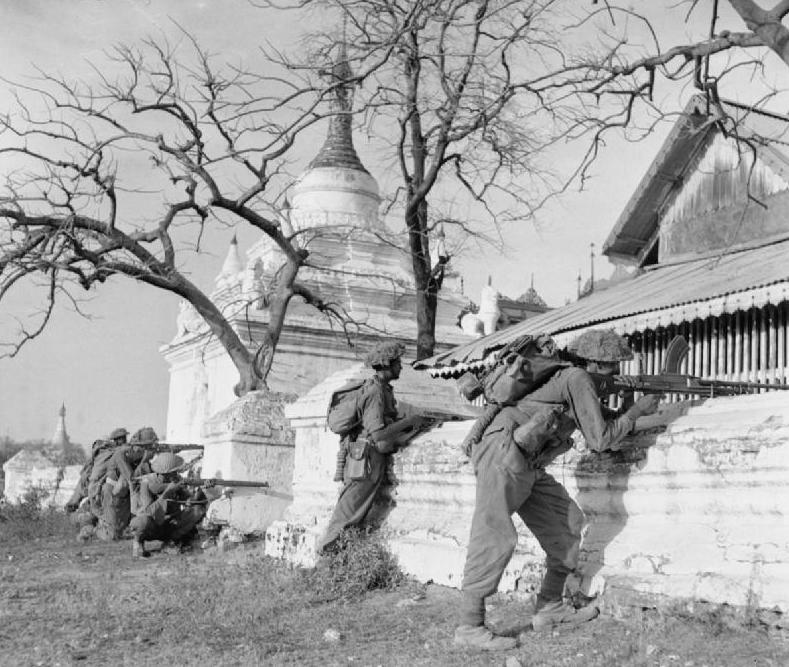 “By the old Moulmein Pagoda….” Indian troops of 19th Division open fire on a Japanese strongpoint, Mandalay Hill, 1945. Slim died in 1970. The lower middle class boy, who had slipped into the commissioned ranks of the British Army in the emergency of 1914, and remained an officer in 1918 only by transferring to the less prestigious Indian Army, was Field Marshal Viscount Slim of Yarralumla and Bishopston, Knight of the Garter. Like the army he shaped and led to victory, Bill Slim was unstoppable. Click here for a moving video of Charles Dance OBE, reading Kipling’s poem on VJ-Day +70, 2015. Though from a much earlier time, its verses are a tribute to all who fought in Slim’s Fourteenth Army, Indians, Africans, British. Dr. Callahan is Professor Emeritus of History at the University of Delaware and a leading scholar of the Indian Army in the two World Wars. He taught at the University for thirty-eight years and was director of the Master of Arts in Liberal Studies program, where an annual student prize bears his name. In 2017 he published Triumph at Imphal-Kohima: How the Indian Army Finally Stopped the Japanese Juggernaut.